With innovative BioSecure Technology, the compact and easy-to-use Biometric Home Safe promises security that responds with just a touch. A 2-second biometric scan locks in your valuables and handguns behind robust steel walls and ensures reliable quick access for home defense and emergencies. 3.7 million home invasions occur every year – that’s 7 homes per minute. Don’t let your family become part of the statistic. With the Biometric Fingerprint Lock, you’ll be able to keep your firearms away from your kids while still ensuring instant access during any critical moment. 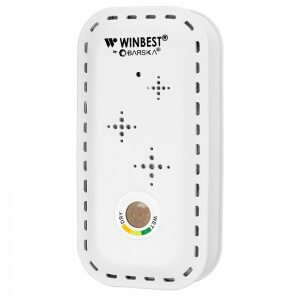 Its advanced BioSecure Technology scans, stores, and remembers fingerprints in seconds, granting reliable access to people you trust and locking out those you don’t. 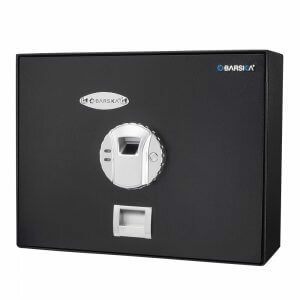 Feel secure all day, every day with Barska’s Biometric Security Safe. Human error can mean the difference between success and failure during emergencies. 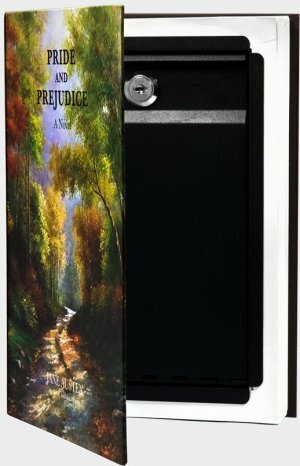 With the biometric gun cabinet, there will be no lost keys or forgotten numerical combinations! Its central database remembers up to 120 fingerprints for precise, 2-second biometric scans every time. 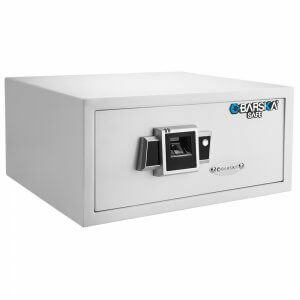 We’ve coupled advanced biometrics with a sturdy steel frame to give you durable protection for your valuables and DOJ approved storage for your firearms. Tamper-proof inner edges, 2 pry-resistant steel deadbolts, and a mountable design will keep sensitive materials safe from intruders and your handguns away from young children. 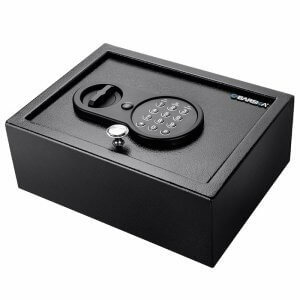 The safe even emits a continuous tone if left unlocked for more than 3-5 min for heightened security, extra value, and peace of mind. 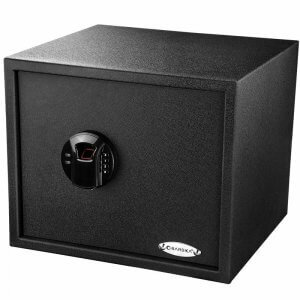 With 0.28 ft³, the Biometric Home Safe has the compact space you need to secure semiautomatics, ammo, medicine, jewelry, and private documents. Mount it in your closet, hide it beneath your bed, or even bolt it onto your nightstand. By optimizing storage functionality, the Biometric Security Safe acts as the most effective, secure, and discrete storage solution for hotels, firearm owners, and parents. 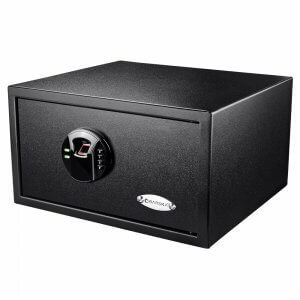 4 AA batteries power the Biometric Security Safe for up to 1 year. And if you accidentally forget to change batteries, simply use the keys and hidden keyhole for manual access when you need it most. 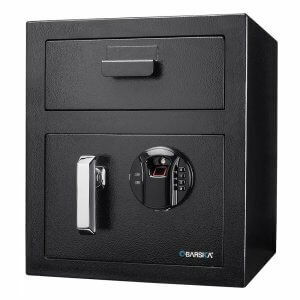 The safe is also compatible with backup battery packs for worry-free access year-round. I almost bought the larger version of this, but this was the perfect size for my needs. It is small so mounting it is a must, but it fits nicely in one of my closet shelves. 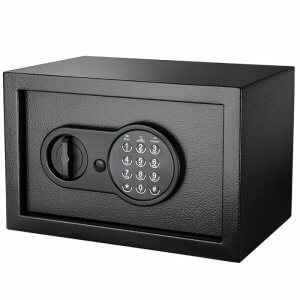 I like that the keyhole is hidden and the biometric quality is unheard of at this price, which is the main reason I bought this as opposed to other gun safes. There's no way my kids can accidentally open it. It won't keep someone with a sledgehammer out but it will keep my sons away from my firearms and that's all I care about. I really needed a biometric scanner now that my kids are starting to walk and explore their surroundings. The scan for this safe takes about 3 seconds and I'm happy that it opens on the first try 98% of the time. 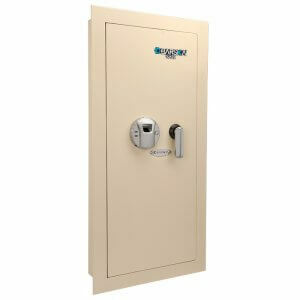 Really, really nice safe and does a sufficient job of keeping my pistol away from my daughters. Easy to install with mounting holes in back & bottom. The silent feature ( turning off the beep ) is a plus. Seems to be fairly sturdy. I just needed a small safe for downstairs where I keep my wallet, phone, keys, etc and this is just the right size. 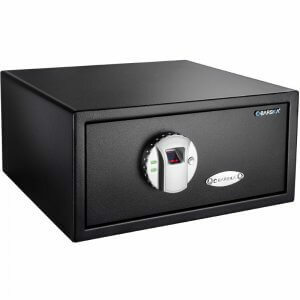 I bought this safe to replace a GunVault MiniVault which had suffered a series of progressive failures in its electronics, which culminated in it completely losing any ability to change the access code from the factory default. GunVault seemed uninterested in repairing it. The Barska Compact is a much better safe for the purpose, better built, better designed, faster to get into when needed, and with better control over who can open it. The first thing that struck me is that while the MiniVault is made from slightly heavier gauge steel, the locking bolts on the Barska are very clearly far more serious than the very small spring-loaded hook latch on the Mini_Vault. Second is that while the total interior volume of the Barska isn't all that much larger than the Mini-Vault, it's much more usable due to its shape. And the third physical win is that the mounting holes for bolting the Barska down are MUCH more usable and accessible than the MiniVault's. Since it appears the safe will accept an external 6VDC power supply (and then presumably use the batteries only for backup power), it would be nice to know what current output and connector type are needed. It should of course go without saying that one should NEVER rely on a small safe like this UNLESS it is securely bolted to an immovable -- or at least not practically movable -- object.